I can’t remember where I first saw this quote but I instantly knew I needed to create a printable with it. Sure, cleaning up my “creative space” can help clear my head before I begin, but sometimes after a day of creating I just wanna leave my mess behind. Can you relate? If so, I hope you’ll enjoy this FREE Chalkboard Printable that you can print out and frame. This print would be perfect for a craft room or gallery wall. This is for personal use only and cannot be re-sold or re-distributed. Haha… Giving this printable a big AMEN. Good luck with the packing! Thanks Alexis! It’s funny because I only like to work on projects once my area is clean and neat, yet I am also the messiest crafter EVER! Haha. We did some power packing today and will just need to do a bit more during the week. Fun stuff! Omgoodness. I am printing out like 17 copies of this and hanging them all over my house. 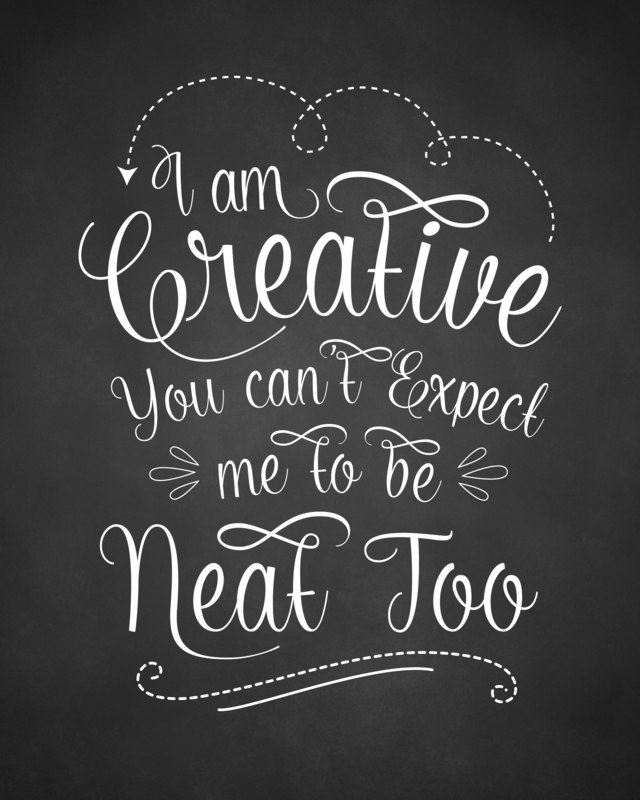 😀 My husband is the neat-nick in our family, and I am ALWAYS giving him the “I’m a creative” excuse! Hah! Thanks so much for sharing, Katie! Hahaha, I’ve been giving the same excuse to my husband too. Well that plus we are moving in a few days so that doesn’t help, lol. Thanks for stopping by! Ohhhhh I’m printing this out and putting it on my husbands desk NOW!! Thank you so much, I absolutely love it! So glad you like it, and that I’m not alone. Maybe we should make one that says “My wife is creative so I can’t expect her to be neat too”. haha. What a cute printable! I especially like the saying. Visiting from Bow Full of Lemons linky party. Thanks for stopping by Tanya! Love it!! I need to hang one of these in every single room in my house!! Ok, I’m a newbie at anything crafts. I saved the printable but have no idea how to transfer this onto a chalkboard. Can anyone give me a tip? Clearly you’ve been peering through the windows at our house and were inspired to create this lovely printable!!! Nice to know from the comments here that I’m not alone, sometimes the fact everyone has eaten & has clean clothes feels like the best I can hope for whilst I start another project! This printable is perfect for me! Thank you! This made me laugh and brought a smile to my face. Printing and hanging up with pride! Thanks! Love this Katie – that is exactly how I feel right now! Thanks for the free printables… pinned! Thanks for the FREE Printable. I love it! Love it! I just bought a stamp today from the Michael’s $1 section that said something very similar so this totally spoke to me. Thanks for sharing! This is the best!! I’m totally printing one for my craft room tonight!! LOVE this!! So, so true!! Hope your move went well! Thanks so much for linking up at Thursday STYLE. You just think of the cutest things in the world! You’re welcome and thank you so much for sharing! I LOVE YOUR HONESTY AND I CAN TOTALLY RELATE TO THE PHOTO OF YOUR SEWING SPACE! WE ARE CREATIVES, SO WHY DO WE HAVE TO BE “NEAT” ANYWAY? THANKS FOR SHARING THIS!